At Oden Services UK Ltd we take data sanitisation very seriously. Offer fully certified data erasure/data destruction? Total data erasure (also known as secure data destruction) is a way of preventing an unwelcome party from recovering sensitive data that has supposedly been deleted from a hard disk drive, or other storage device. Large volumes of confidential data such as private business files, credit card numbers, bank details, medical history and classified information are often stored on computer hard drives or servers. 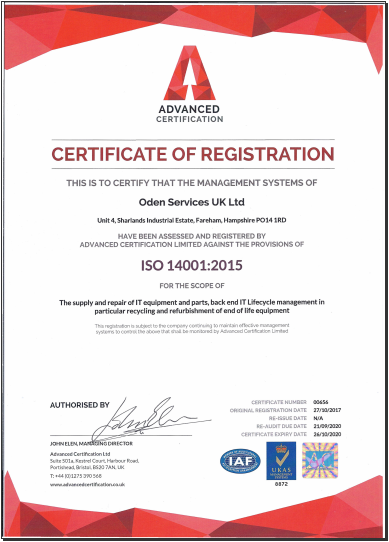 Have the correct Environmental Accreditations such as ISO14001 or AATF? IT asset disposal companies must hold legal certification required for a company to carry out a compliant IT recycling service. A T11 exemption is the minimum requirement for a company to handle and process WEEE, an accomplished company will be certified as an AATF (Approved Authorised Treatment Facility) is the highest tier of WEEE recycling and allows treatment of waste electrical and electronic wastes. Treatment can include de-pollution, disassembly, shredding, recovery or preparation for disposal.This ensures the recycling company is environmentally compliant. Many IT producers such as Dell and HP rely on AATF's to provide compliant recycling to fulfil their obligations of downstream product. Again, whilst not a legal requirement, a portal containing previous collection details, asset lists, environmental compliance and data erasure / destruction certificates can prove invaluable. In the event you find yourself in the position of a data breach or environmental enforcement action you can provide all relevant information to provide you have displayed correct due diligence.